The first in-depth examination of the Linux tech that holds the smart rifle's system together. TrackingPoint's goal wasn't simply to create a better rifle when they began incorporating Linux and high tech laser rangefinders into their early firearm systems, instead it was to make the best rifle offered in the world. TrackingPoint's goal wasn't simply to create a better rifle when they began incorporating Linux and high tech laser rangefinders into their early firearm systems, instead it was to make the best smart rifle offered in the world, period. First shown off to the tech community at the 2013 Consumer Electronics Expo in Los Angeles, the company implements a combination of ARM CPUs, lasers, and on-board Wi-Fi to determine shooting accuracy. That combined information allows hunters and other armed individuals to increase their distance for accuracy. In their feature article on TrackingPoint and their top-of-class .338 Lapua XS-1 PGF, Techcrunch broke down the technology further "The HUD and other user interface elements are all powered by a custom C++ application that renders to the framebuffer using OpenGL. This application is responsible for all the animations, reticules, range display, and other non-video output of the HUD. The video from the front of the scope is all handled by a custom GStreamer plugin. The whole scope runs a variant of the Ångström distribution of Linux atop a TI DaVinci 8148 processor." The firearms industry has often been looked at as a dinosaur in technology, as few products are newly innovative or offering technology any different from what was used for firearms in World War II. 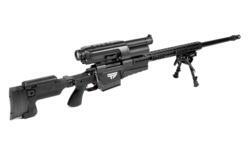 Precision Guided Firearms represent a major leap forward for technology in the gun industry. PGF's come with two iOS or Android apps (with more to come). First is the TrackingPoint App, which Configures your PGF, enables software updates, transfers shot videos to your smart phone, helps you get the most accurate shots possible, and has an option that locks out advanced features when storing the firearm. The second is the ShotView App that streams video in real time from the heads-up display of a TrackingPoint PGF to a smart phone or tablet. TrackingPoint smart rifles have a Networked Tracking Scope that allows this video streaming.